Academy award winning filmmaker Steven Spielberg (centre), stands with Holocaust survivors Fira Stukelman (left) and Rena Finder,at the International Day of Commemoration in Memory of the Victims of the Holocaust. 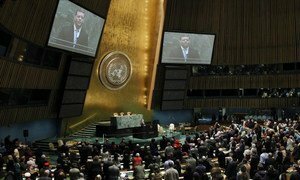 The United Nations today paid tribute to the 6 million Jews and countless others massacred in the Nazi Holocaust with a solemn ceremony in the General Assembly Hall, a rebuke to Holocaust deniers, and a warning from Secretary-General Ban Ki-moon of the perils of anti-Semitism and hatred of any kind. “The United Nations was founded to prevent any such horror from happening again. Yet tragedies from Cambodia to Rwanda to Srebrenica show that the poison of genocide still flows,” he said in a message marking the International Day of Commemoration in Memory of the Victims of the Holocaust, held every year on 27 January, the date on which Auschwitz-Birkenau, one of the worst German Nazi concentration and extermination camps, was liberated in 1945. Mr. Ban recalled his own visit to the camp in November as he walked through the “infamous” gate bearing the metal slogan ‘arbeit macht frei’ (work makes [you] free) and stood near the crematoria that burned the corpses of so many victims. “I will never forget my visit,” he said. “I saw the horrific remnants of the machinery of genocide, as well as moving images of European Jewish life in the 1930s - weddings, family meals, rituals, other scenes of simple daily life - all extinguished through systematic murder unique in human history. “I saw the barracks where Jews, Roma, Sinti, homosexuals, dissidents, prisoners of war and persons with disabilities spent their final days in the most brutal conditions,” he added, calling for unflagging vigilance against bigotry, extremist ideologies, communal tensions and discrimination against minorities. UN High Commissioner for Human Rights Navi Pillay, recalling her own visit to Auschwitz-Birkenau, has a “simple message” for all those who deny that the Holocaust happened, or who engage in anti-Semitism and other forms of religious, racial or ethnic intolerance or discrimination. “Each year, on 27 January, we take time to remember the victims of the Holocaust and to reflect on how it came about, and how the world at large failed so dismally to prevent it. The Holocaust stands as a searing reminder of the perils of discrimination and intolerance, and of just how powerful and deadly the incitement to racial hatred can be,” she added, stressing the imperative of reacting quickly and firmly discrimination and violence against individuals and entire communities wherever they occur. Ms. Pillay noted that despite the revelation of the full horror of the Holocaust, the flames of hatred and persecution have risen again to consume other countries, people and societies – from the killing fields of Cambodia, to the forests of Srebrenica in Bosnia and Herzegovina, and the hills of Rwanda. “Even today, in many places around the world, people are persecuted or discriminated against because of their race, religion, origin, sexual orientation or political opinions, and in countries such as Syria, the Central African Republic and South Sudan, people are still being maimed and slaughtered because of the group to which they belong,” she warned. Opening the commemorative ceremony, General Assembly President John Ashe stressed that the Day underscored the international community’s determination that “such unfathomable horror and unspeakable cruelty” would have no place in this world. “Today, we are gathered here, to bear witness for all those who were brutalized, who suffered and who died, and we are also here to bear witness so that we the living never allow such a terrible tragedy to occur in our shared human history,” he said. “We will not forget them, we have not forgotten them, and they have not left us in vain. The sheer ferocity and pervasive cruelty of the Holocaust brought to fore a deep and powerful moral imperative that crimes of such enormity must be forever eliminated from this planet. “Tragically we are all aware that the Holocaust is with us today in ongoing attempts at genocides all around our planet,” he added, highlighting the UN’s role in bringing home the message. One of those witnesses was in today’s audience. Rena Finder, a Holocaust survivor whose name appeared on the real-life Schindler’s List, shared her testimony in the General Assembly Hall. "Encouraging young people to be more accepting of others and learn from the cruelty that was inflicted on Jews and other minorities during the Holocaust has been my life's work,” she said. In a later interview with UN Television, Mr. Spielberg said education was the greatest thing the UN could do to prevent further genocides by disseminating eyewitness testimony. Today’s ceremonies are accompanied by two exhibitions at UN Headquarters under the theme “Remembrance Week: Journeys through the Holocaust,” marking the 70th anniversary of the deportation of over half a million Jews from Hungary to the German Nazi death camps. Those who risked their lives to save Jews and others from mass extermination in the Second World War are inspiration for the courage to fight for a better world, Secretary-General Ban Ki-moon and other United Nations officials said today.